Bring the “Ariel Extreme Challenge” to life through a creative video! Ariel Detergent, a leading global P&G brand providing superior cleaning, has been working with a successful creative advertising concept called “unfair conditions”. 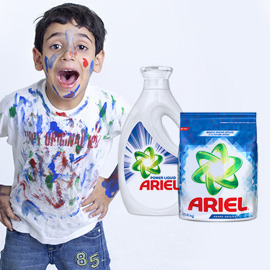 It showcases a side by side comparison to prove that Ariel is more powerful than other detergents. Ariel would like to create a new challenge always showcasing extreme conditions, but without a comparison to another brand. We are looking for new ways to show the superior performance with less of an “advertising” and more of an engaging feeling to bring the Ariel CHALLENGE to life in the digital world. Create a surprising and authentic video that shows that Ariel always wins in the battle for clean, without a comparison to another brand.